After a while my head hurt from trying to decipher what everyone was saying. Also the film quality is quite bad, which is unavoidable sometimes but hard on the eyes. But what really ruined it was the hero’s irritating inability to pick one sister over another, which went on for too long and made him look either spineless or like a two-timing loser, pretty much killing the romance for me—neither characteristic being very heroic. Anyway, on to the story. Sonia (Sadhana) lives with her paternal uncle, General Rajpal Singh (Kishore Sahu), aunt and cousin Sheela. Her aunt (Shobhana Samarth) and Sheela (Azra) treat Sonia like an ugly stepchild, making her wait on them hand and foot, and undermining her self-confidence at every opportunity. Her uncle is kinder, but indulges his wife and daughter. Sonia’s only ally is her grandmother (Durga Khote) who thinks Sheela and her mother are spoiled and silly. 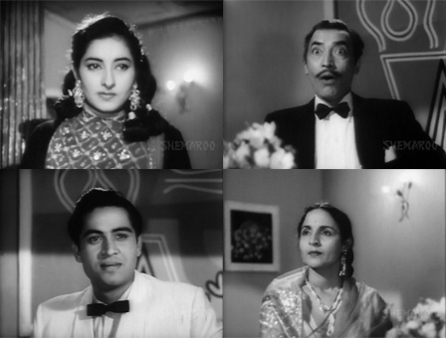 Sheela is engaged to marry Dev Kumar Mehra (Joy Mukherjee), a rich guy whom she met in college and is mostly interested in for his money. Dev is on his way to stay with the Singhs. Sonia overhears her family talking about her and finally snaps. She makes a bet with Sheela that she’ll win Dev away from her by treating him like a god (urgh). Sheela is unconcerned about losing this bet; and when Dev arrives he is very clearly smitten with her. The family all set off for a dance competition, but make Sonia stay home. She breaks down in front of her grandmother, who decides to help her. Of course, the first thing to go is her glasses. Some jewelry, better clothes and an updo later, Sonia is devastating. The Indian Audrey Hepburn, in fact! 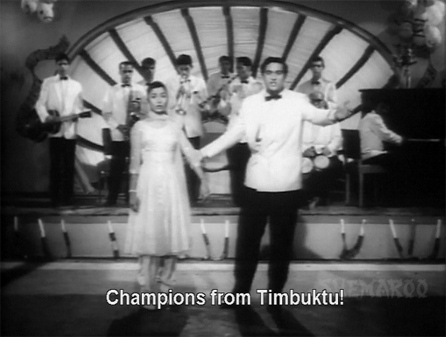 Sonia and her grandmother go to the dance competition, where Sheela has blown off Dev (who says he can’t dance) in favor of other partners: the Bombay champion, the Madras champion, the Calcutta champion…you get the idea. Everyone is amazed by Sonia’s new look, although not everyone is happy about it. Naturally, jealous Dev asks Sonia to dance with him, and they win the competition! much to Sheela’s chagrin. It’s a fabulous song (“Gaal Gulabi”) which stands out even amidst all the other wonderful songs! I like that alcoholic eyes are a good thing. Anyway, as time goes on, Sonia puts her plan into action and goes after Dev’s affections to pay back Sheela for her arrogance and insults. From the beginning it’s clear that they are better together than Dev and Sheela. Sheela has ambitions towards being Miss Simla and winning a film contract, and she ignores or bypasses Dev in these endeavours when it suits her. This naturally hurts his feelings, and gradually he is drawn to Sonia, with whom he always has fun. They are quite mischievous together, although their dialogues confuse me. This goes on for a really long time. 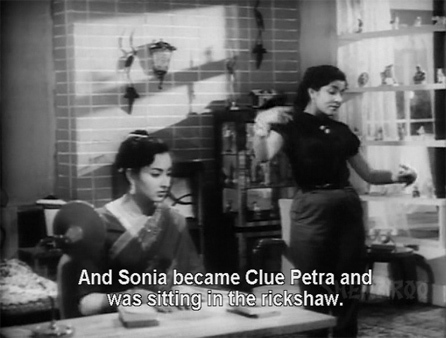 When Sheela is around, Dev romances her and pretends that Sonia means nothing to him. But when Sheela is absent, he is very happy to be falling in love with Sonia, as she is with him. How can that possibly go wrong? Sheela is infuriated, and of course Sonia gets all the blame—not Dev for being deceitful or Sheela for being a vain, selfish, horrible person. And being the good girl that she is, Sonia agrees to sacrifice her love. What will happen next? Will Dev find out about the bet? Will he marry Sheela? Will Sonia ever find happiness again? Will the subtitles ever make any sense??? Watch Love in Simla to find out. It’s not the worst movie, but my expectations were high, and I disliked the rampant sexism (yes, I know they were barely out of the fifties). If you don’t need subtitles, you’ll be much better off too! And honestly, the songs are worth watching it for alone. Posted on August 10, 2008 at 3:00 pm in Hindi movies	| RSS feed You can skip to the end and leave a reply. Hmpf, yes, the glasses thing. It annoys me, too. I mean, people usually don’t wear thick glasses for fun, so how come they can cope without them all of a sudden. But otherwise it looks like something I might want to watch. This is OT but have you come across “Prem Kahani”? It stars Rajesh Khanna and Shashi Kapoor, so I thought of you when I saw it yesterday. It is far less of a soppy romance than the title suggest. I do have Prem Kahani, and watched it a long time ago. I am currently digging out all my Rajesh Khanna movies and making a stack of them to rewatch (and if Shashi and Vinod are in it too, it goes to the top!). :-) Are you—dare I ask?—a Rajesh Khanna fan? 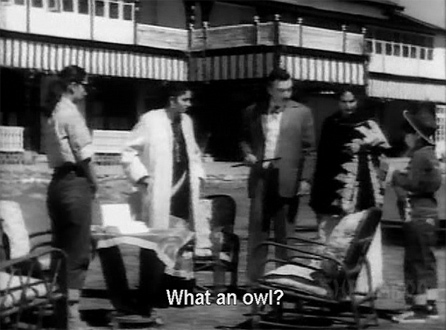 Maybe you should include the phonetic spelling of the Hindi dialogues which subtitles you didn’t understand? We could all help to translate it for you. Its too bad the subtitles didnt do otheir job here. 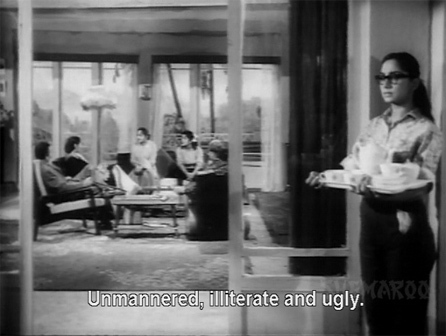 This is a pretty cute movie inspite of all the blatant sexism (or maybe I dont object to sexism when it comes packaged as Sadhana-Joy Mukherjee!) 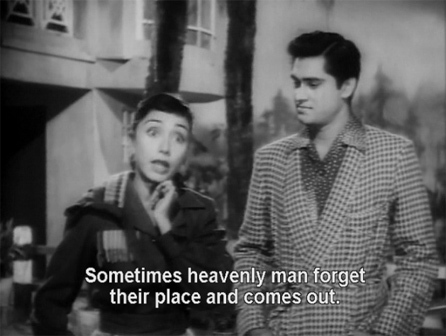 and Joy Mukherjee and Sadhana do look so cute. I feel like watching this movie after reading your review! Alas I don’t think i i will find it here ie Down Under! I managed to find AB’s Majboor and Do Anjaane and hopefully watch them soon. 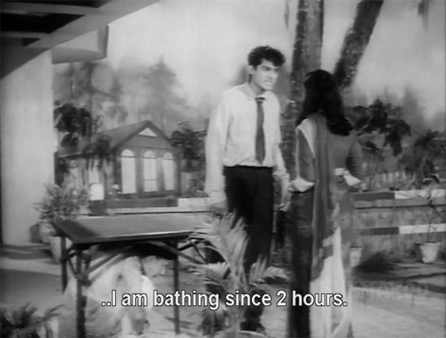 is that Joy Mukherjee as the hero! I like to think with my coolio glasses that when i take them off a boy says “Vaah! she has alcoholic eyes! !” I lovvve Kishore Sahu’s reaction to her makeover! Isn’t that Sadhana cute! And if not for Joy Mukherjee’s illustrous antecedents, I don’t see how he’d have had a hope in hell of making it as a bollywood hero. Sounds like a most unappealing character and then it was Joy (aern’t his sons or nephews called Boy and Toy? ), poor fellow. Could’ve worked if it’d been Dharam in the role for instance. On Prem Kahani, it was the only flop of the Mumu-RK jodi (apart from Raja Rani and Aaina where each had guest roles). And the blame lies squarely on the absolutely idiotic resolution in the end–it had all the makings of continuing their amazing luck at the BO otherwise. But a fun watch nevertheless memsaab so do let us know what you think when you’re done with it. I watched the beginning of the film, but never got around to watching the whole film. 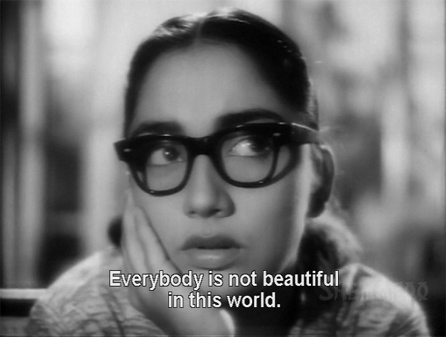 Just saw ‘Breakfast at Tiffany’s’ last night, and yes, Sadhana is like Audrey Hepburn. She looks so delicate, and yet strong, innocent but someone with her own mind. Have never liked Joy Mukherjee though. This was a cute movie, despite all of those obvious drawbacks – Joy Mukherji’s character needed a good shaking, I think. 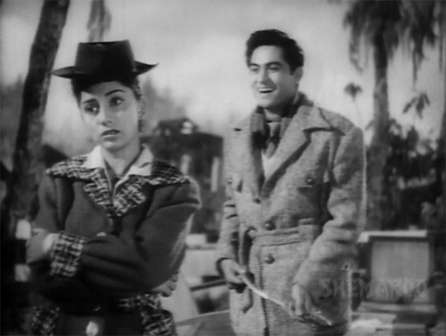 Another enjoyable Sadhana-Joy Mukherji starrer was Ek Musafir, Ek Haseena: awesome music too! I feel very neutral about Joy and Deb Mukherjee…they don’t really bother me, but they are kind of bland. Cute, but bland. Does Joy really have sons or nephews called Boy and Toy? Yikes! And I really did just want to shake him in this. He was so….urgh. I think that’s the main reason I couldn’t love this movie, is that he was so spineless and/or bewafaa! The bad subtitles were just another nail in the coffin. I didn’t hate it, I enjoyed some of it–especially the songs, they were brilliant. The only other soundtracks I have songs from by Iqbal Qureshi are Qawwali Ki Raat (Jate Jate Ek Nazar being a great qawwali from it) and Cha Cha Cha. Have not seen the films but really like the music. I’ve never understood the deal with the eyewear. When done right, glasses do no harm (in fact, they can make a woman look rather attractive, I think). Yet, in Sonia’s case (what with those birth control glasses, really), it was refreshing to see them go :o) What a great before and after…thanks for sharing! In the west, owls are considered to be wise! and, interestingly, are often pictured with horn-rimmed glasses :-) But thanks, it may have been what was meant. I vaguely remember seeing this movie way back on television.Your post was very enjoyable to read and I am sure the music of the movie made it worthwhile to watch this. Thanks Reviewer, please keep visiting! It seems the subtitles were pushed through by someone who was doing a literal translation, which kills the original sense of the dialogue- a common malady. i agree with madhu about ek musafir ek haseena, story is a bit confusing but the songs are fantastic. I do like Love in Simla, but i can understand that a film can be spoilt for you if the subtitles are not right or picture quality is poor. 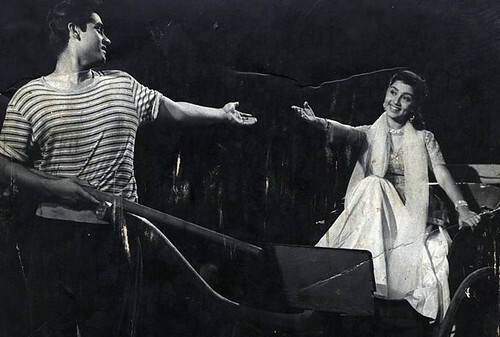 Have you seen Shagird with joy and Saira Banu? great songs in that as well. hi, i’ve been looking for this movie for quite some time.. can u tell me whr did u find this movie n where can i download it from? Priyanka, I got my copy from nehaflix.com—I think they ship worldwide, not sure where you are. Their customer service is fantastic, and they are very reliable. 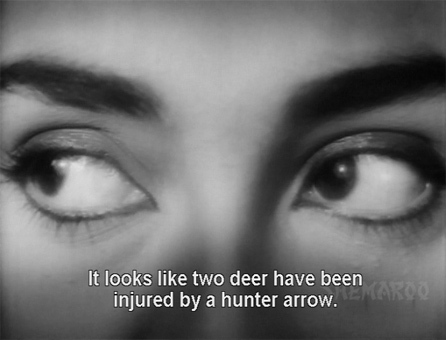 Don’t know if the subtitle said “alcoholic eyes” for “sharaabi aankhen” or if that is your translation, but it’s inaccurate. 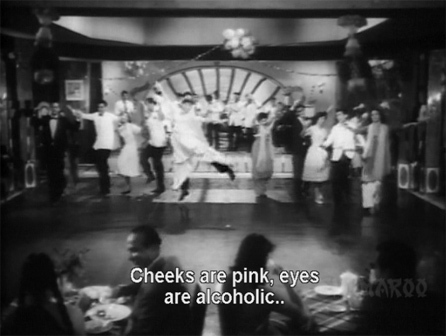 “sharaabi aankhen” is simply an old-fashioned metaphor for “intoxicating eyes” — guess they didn’t think anything else could intoxicate except alcohol! But in any case, plot lines usually tend to revolve around the usual suspects and we all know who THEY are. 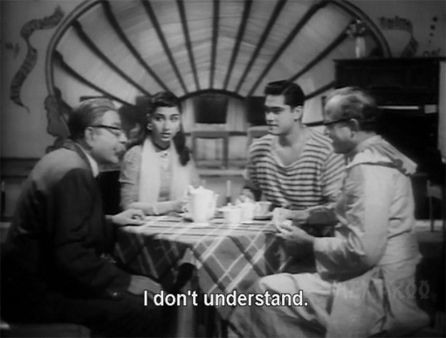 I loved the tomboy Sadhna at the beginging with thick glasses. 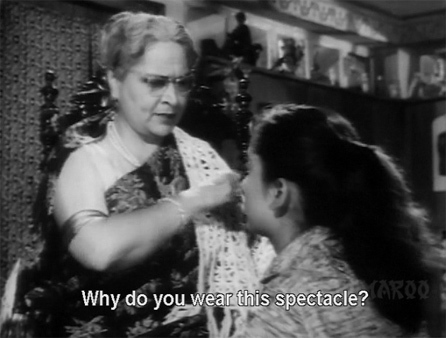 and the lovely Durga Khote giving her lessons in deportment and a makeover. She looks so amazingly pretty in the first scene after that. I am sure the nation flipped over the pretty girl then. I found the movie a bit draggy in places, but still a pretty romance. I need a copy of this film. I want to gift it to my father. He loves old movies and even I like to watch along with him. Can someone forward me a link for download. They are few websites I tried to buy but they don’t deliver to my island. Agreed!!! Saira gets on my nerves too. You can get most of these on YouTube. You can mirror them on to your Smart TV. Okay, the girl needs glasses, without which she can’t see and gets headaches. So then how does she manage? A bumbling, stumbling, uncoordinated creature would have a hard time just being. Why don’t they tell us Grandma got her contacts? I’m thinking of Aaina from the ’90s, where Juhi undergoes a similar transformation. Except for Peter Parker/Spiderman, I’ve not heard of people’s vision improving to the point where they could just discard their glasses (of course, there’s the Bates method and also the no-sugar-in-any-form theory). I detest this plot stumbling point. Only Dharmendra in Dillagi shows us how badly he needs his glasses and only then can he beat up the baddies. If a person has a symmetrical face (this was one of the definitions of beauty on a Discovery channel show, long ago), how can glasses hide that fact, unless they’re really, really sodabatlis (in ancient Bombay slang)? 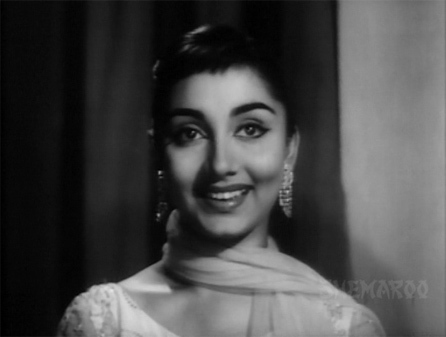 Sadhana’s transformation was beautiful but I also liked the other girl who played Sheela in the film she was very attractive and pretty too.does any one know more details about her or if she was just one film treat. 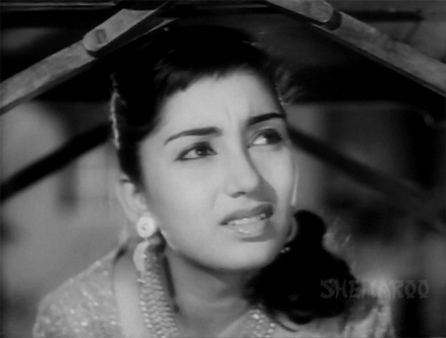 Sheela was played by Azra, who was also in Junglee (she played Shammi’s would-be princess wife) and in some other things as well. Joy Mukherjee paved the way for chocolatey heroes and was made obsolete by advent of Dharmendra, Jitendra and Rajesh Khanna. NO memsaab it is not available anywhere, you please let me know from where i can order for CD or DVD for this film, youtube link does not work. I request you for two more films one is maayajaal in 60s, namaste ji 1965. It would be a great help if you would help me in finding these three movies.